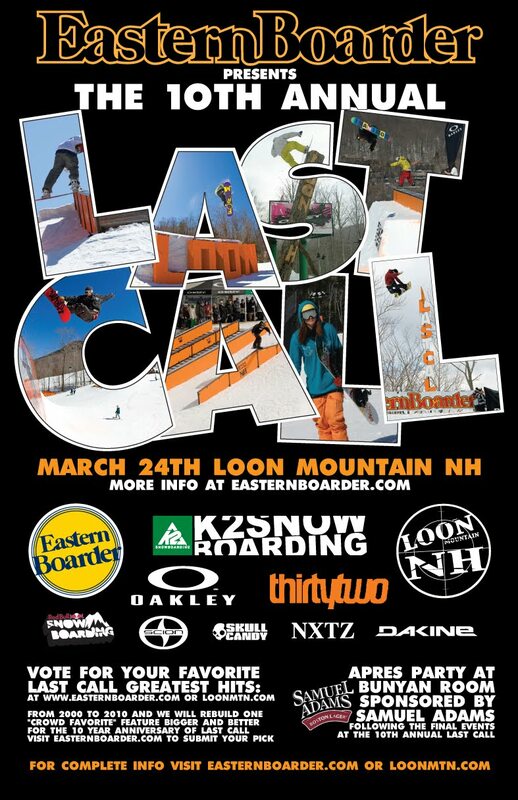 The Blog / EasternBoarder : Last Call 10 is WEDNESDAY!! Last Call 10 is WEDNESDAY!! This is the 10th Annual Last Call.... Those of you that have come to any or all of the past 9 Last Call Events know it is the real deal. Each year we build the best features and throw the best event on the eastcoast... possibly the nation. Past winners have gone on to promising carreers, and we're not claiming Last Call had anything to do with their success, but Pat Moore, Scotty Lago, Shane Flood, Austin Stephens, Chris Grenier, Chris Carr, Teddy Lavoie and Chaz Guldemond all have stepped up to the Last Call podium at some point in the last decade. We hold Last Call on a Wednesday to keep out the weekend warriors and riffraff.